During this time period in the United States there was very little education available to women because their lives were centered on domestic obligations. She was fortunate enough to attend a local grammar school in New York and New York Central College which was actually a Baptist abolitionist secondary school. Later on she attended Oberlin College’s Young Ladies Preparatory Department that was founded by abolitionists in 1835 and was the first college in the nation to admit women and African-Americans. Though she was privileged to attend college she didn’t go without experiencing opposition during her education. At Oberlin College she was accused of poisoning two white female students and was beaten while awaiting trial. Another time she was accused of stealing brushes and paints; after this in one account it says Oberlin didn’t allow her to complete her final term and graduate, another says she decided to pursue sculpting. (“Women in History,” 2013) Regardless, she did leave before completing her degree and went to Boston to study with Edward A. Brackett. She traveled and spent much time in Europe working with other aspiring female artists such as Harriet Hosmer and Anne Whitney. In her lifetime she made many significant accomplishments in the art world and became the first internationally accredited female African-American and Native American sculptor. She sculpted many leaders of the abolitionist movement as well as courageous women. (Dubac, 2012) She completed many pieces in her lifetime, many of which have been lost; some are currently in private collections, colleges such as Harvard and Tuskegee while others are displayed in museums. Some of her better known pieces were The Freed Woman and Her Child, Forever Free and Hagar celebrating emancipation. She also sculpted individuals such as Ulysses S. Grant and Abraham Lincoln and created a famous bust of Henry Wadsworth Longfellow. At the International Exposition of Painting and Sculpture held at the Academy of Arts and Sciences in Naples she won a gold medal for a cherub piece Asleep and a certificate of excellence for Love Caught in a Trap. In 1873 she further pushed the odds and was the first internationally renowned female sculptor to exhibit in San Francisco and San Jose with pieces such as Lincoln, Asleep and Awake, Cupid Caught, and The Marriage of Hiawatha. 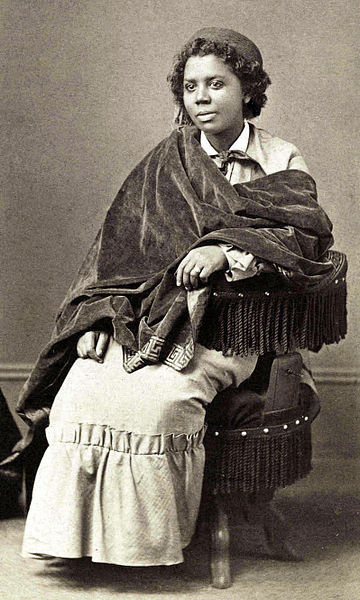 (“Edmonia Lewis,” 2012) She was the first to link her race with her achievements, stunning those in society that believed blacks didn’t have the intelligence nor the capacity for fine art. She would stand by her works, take photographs, and discuss her pieces in detail to those willing to listen. She went through exorbitant odds to become such an accredited artist during this time period of the United States. She was a pioneer that broadened the horizons for minority artists like her. Her passion and drive kept her going despite all the opposition she faced and through her leadership and inspiration she spurred generations of artists some of which went with her to Europe to get away from the harsh environment of the United States and study from masters and create works of universal appeal. She worked against the boundaries society had set for her, she didn’t allow her race, gender or societal class prevent her from achieving her full potential, and she become one of the greatest artists in history.